To make this delicious drink simply feed carrots, ginger, turmeric, and orange through the juicer, stir gently, and drink your way to better health. Oranges, as most of you know, are loaded with vitamin C and nutrients that help boost your overall immune health, protect against cancer, and prevent against a wide variety of diseases. Carrots are loaded with beta carotene, a precursor to vitamin A, this powerful antioxidant that helps protect you from cancer, reduce aging, and support eye health. Ginger, in case you haven't noticed, is one of my favorite herbs. Ginger packs a whole bunch of health benefits into one small, spicy package. You'll love the warm flavor lends to many dishes and your body will thank you as it improves over all digestive health, floods you with antioxidants, and fights off nausea. Turmeric I've mentioned before and will go into greater depth at a later date as it truly deserves more than just a brief mention here and there, but for know here's what you need to know: Turmeric contains a compound called curcumin. Curcumin is a powerful anti-inflammatory and when taken regularly can help alleviate pain from injury, arthritis, auto-immune pains and other forms of inflammation. Turmeric is also considered by many to be one of the best anti-tumor, anti-cancer herbs you can find in nature. like i said, more on this to come. This blend will jump start your metabolism and digestion, provide you with natural energy, and fill you loads of nutrition. Add water, kombu, and dried shiitake mushrooms to a medium pot and soak for 15 minutes. Remove shiitake mushrooms, cut off and discard the stems, and thinly slice their caps before returning them to the water. Bring water, kombu, and shiitake mushrooms to a simmer for 15 minutes. DO NOT ALLOW TO BOIL. After 15 minutes remove from heat and discard kombu, and shiitake mushrooms. The remaining water is now your basic Dahsi broth. Remove from heat and add 4-5 tablespoons of organic miso paste to the water and stir until blended evenly. Add 2-3 teaspoons of dried wakame seaweed and stir. So, what's it good for? Miso paste is a fermented food traditionally made from soy beans, sea salt, and koji. It contains powerful probiotics, enzymes, and virtually all of the essential amino acids. Miso, a staple in the Japanese diet, is consumed multiple times a day: as breakfast, before meals, and in times of illness. Miso not only provides plant based protein, but also supports healthy digestion, regularity, immune system function, and detoxification. Wakame, a sea plant, is a great source of iodine, an essential nutrient that supports thyroid functions. Wakame also provides the body with readily digestible plant based calcium and magnesium. Shiitake mushrooms have been studied for their anti-cancer properties, antioxidants, and immune boosting effects. Miso soup is a traditional Japanese recipe that has many different variations. The recipe I have provided here is the simplest (and in my opinion, best!) miso soup you will ever make. I hope you enjoy it as much as I do. Over medium heat add 1 tablespoon coconut oil, ginger, garlic, and onion to a medium stock pot. Cook until fragrant (about 2 minutes). Add one 13.5 oz. can of light coconut milk. Add and stir one 4 oz. can of Maesri red curry paste. Stir until curry paste, garlic, ginger, onions and coconut milk are completely mixed. Add one 13.5 oz can of full fat (classic) coconut milk. Add chopped carrots, peppers, and broccoli. Add protein (tofu, chicken, etc.) if desired. Simmer for about 30 minutes, or until carrots are tender. Rinse 2 cups of white (or brown) basmati rice under cool water until water runs clear. Stir rice into melted oil making sure to evenly coat the grain. Reduce to simmer and cover until rice is tender and all water is evaporated. Remove from heat, fluff, and cover and let sit for 5 minutes. Add a hearty portion of rice to a bowl and top with as much curry as you like. This recipe has become a household favorite of mine. It's packed full of vitamins, minerals, antioxidants, anti-inflammatories, and anti-cancer nutrients. It's very high in fiber, and extremely flavorful! Chili peppers, garlic, and ginger are the three most beneficial spices found in this dish. I've included brief descriptions of their therapeutic effects. The other ingredients in this recipe will be expanded upon in later blog posts, so don't forget to come back and keep reading! Chili peppers contain capsaicin, a powerful substance that gives them their fiery feel. This chemical has shown promise in preventing prostate cancer, maintining healthy circulation, and managing pain. It may even help trim your waistline; feel the burn! Garlic is a wonderful bulb known for its many therapeutic benefits. Its medicinal value is often attributed to a compound called allicin, found in crushed, chopped, or masticated garlic. Allicin is believed to help lower bad cholesterol and improve heart health. Several sulfur containing compounds found in garlic also help fight infection, cancer, arthritis, and other illnesses. Ginger, a powerful root often used to add warmth, also stimulates digestive health and aids in detoxification of the body. Ginger also has suspected antioxidant properties. The vegetables in this dish contain high levels of vitamins, minerals, and nutrients that will all be expanded upon in later posts. Stay tuned! *while this meal is extremely nutritious and packed full of nutrients, it is not intended to cure any diseases. If you have any concerns speak with your healthcare provider. Beets are naturally high in vitamin C, which helps to boost the immune system. The pigments that give beets their dark red color are strong phytonutrients that may help keep the body free of cancer. Naturally occurring nitrates in beets convert into nitric oxide within the body, causing the blood vessels to relax and dilate, which helps to lower blood pressure and to improve overall circulation. 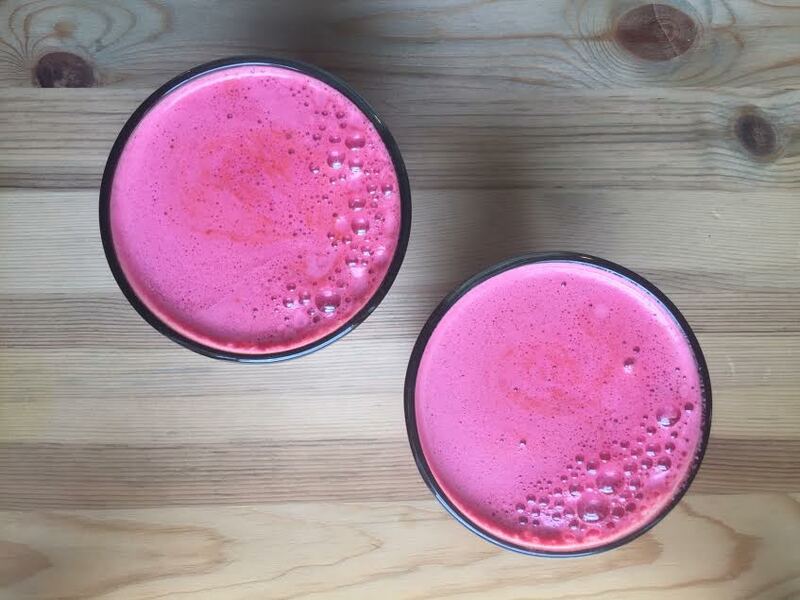 Also, it's no surprise, beets are a powerful detoxifier of the blood and liver. Celery is full of vitamin K, an essential nutrient required for healthy blood clotting. It also contains other trace nutrients such as potassium and magnesium. Carrots are high in beta-carotene. The body naturally converts beta-carotene into vitamin A, which is critical to superior eye and skin health. Vitamin A is also a powerful antioxidant that shows promise in many studies as a preventative to many types of cancer, such as lung and colon cancer. Ginger is a warming and detoxifying herb that aids in digestion and has strong anti-inflammatory and antioxidant compounds. Ginger also helps ease nausea, indigestion, and other digestive disorders. Apples are high in vitamin C and phytonutrients that help protect healthy cholesterol levels, prevent cancer, and boost the immune system to keep you healthy. You know the cliche: "an apple a day keeps the doctor away." Might as well take two! *This recipe is insanely healthy, raw, and incredibly nourishing, but it is not intended to treat or cure any disease. Pigments from the beets may cause red tinted or dark stools, and urine, this is of course harmless. We here at New Morning Natural Foods are extremely excited. After weeks of planning and designing, we are proud to introduce a new chapter to our business in the form of a brand new website and multiple social media channels. As you can see, after decades of operation we have now joined the 21st century, a little late perhaps but with full force, and there is no going back now! With this huge transition we, together with our many patrons, distributors, suppliers, family, and friends, are excited about the infinite possibilities we have before us. We've always had the health and wellbeing of the Northshire community in our hearts, but now it's time to kick it up a notch; With that said, this is the introduction to our new blog - the first of many entries that will consist of healthy family recipes, healthy living education, local musings, and much much more, all posted on a regular basis. We will be writing to reach out, and to connect. We hope that this will bring us together frequently and in pursuit of common goals: Good health, friendship, and the tireless promotion of sustainability and ethical stewardship of the whole of Southern Vermont. So we push. We push ourselves forward, deeper into this amazing new chapter of our business history, with a dedication to providing insight, education, product knowledge, and advice to all members of our community and those beyond. We push to help promote not just ourselves, but also the countless small businesses and farms that work tirelessly to provide our customers with the widest variety of high-quality products and delicious food possible. We hope this will inspire you and your loved ones to make simple changes in your lives and help you become the best, healthiest, earth-friendly versions of yourselves that you can be, and we hope that this community shines as it should shine; in health, in love, and in vibrant life. Here in beautiful Manchester Vermont, every morning is a new morning. What will you make of it?